A dongle will be needed, but you'll be able to pull in over-the-air television signals through your Box. The Boxee Box is really working hard to appeal to cord-cutters everywhere and the upcoming version of the Box will be offering even more. The folks over at NewTeeVee were able to get their hands on a build of the Boxee Box 1.5 update and were surprised to see a new option called Boxee Live TV, which is just what it sounds like. 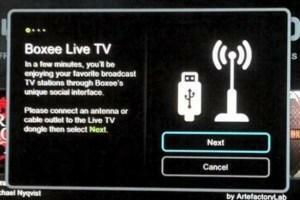 Live TV gives you the option to watch over-the-air broadcasts through your Boxee Box if you pick up a special dongle to enable it. While watching live TV on your Boxee Box is certainly a nice addition, Boxee will also be adding plenty of the social integration that they're known for. There's no word yet on when this update will come out and Boxee hasn't yet commented on the reveal.